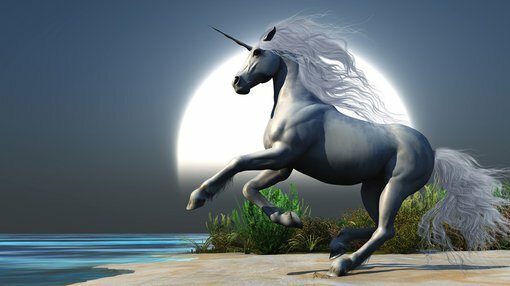 Do you need to own anything to be a unicorn? If there’s anything which has characterised the past few years in the markets, it’s the propensity for the most buzz-worthy companies to have very loose relationships with their assets – if they own them at all. Once upon a time, for a company to be successful it needed to at least have some of its own assets. For example, a mining company would need trucks and rocks. A tech software player would need software it would then sell. But in the days of Uber, Airbnb, and Netflix the platform has been an enabler of the product – where the profit comes not from ownership of an asset but rather from building a marketplace around assets held by other companies. In other words, they don’t own the thing that they sell but merely the method for selling it. For example, Uber doesn’t actually own any of the cars that drive around; Airbnb doesn’t own any of the rooms leased out; Netflix, at least in the early days, didn’t own any of the content; Facebook doesn’t create any of its own content, nor Twitter; Alibaba doesn’t hold any inventory. These days it’s much more about building a ‘platform’ rather than holding anything concrete which a company buys and sells – and investors are becoming accustomed to the idea if the valuations of these companies is anything to go by. 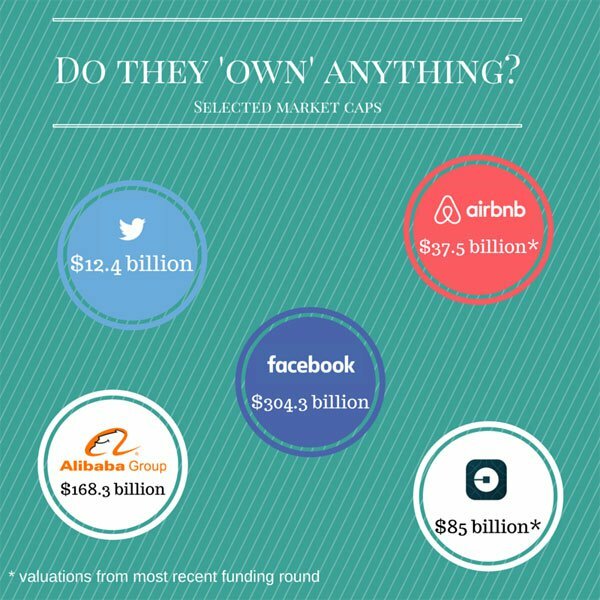 Uber’s latest valuation is a reported $A85 billion, and Airbnb has a valuation going at $A37.5 billion. These companies simply built a marketplace around the assets, and let business happen within that framework. The value is being created on the transaction, not the asset. Uber makes its money from taking a clip from each individual taxi trip. Airbnb makes its money from each hotel room booked. Twitter and Facebook have grown into media giants by essentially not creating any content – much to the chagrin of more traditional media players who have invested their time and energy into creating content to monetise. With Twitter and Facebook, however, the content and subsequently the eyeballs come to them. They just build the platform and monetise the eyeballs. Airbnb and Uber don’t own their assets – again they just built the market platform and let the transactions come to them. In all cases, the ‘assets’ have come from outside of the company rather than being created internally. But as traditional players who have been disrupted by these companies are fighting back – some of these companies are having to adopt a more traditional way of doing business to stem the tide. In the case of Uber, it is facing competition from General Motors and rival company Lyft, with GM investing $500 million as part of a funding round earlier this year. The main aim is to create a fleet of GM electric driverless cars to challenge Uber. Uber meanwhile is diversifying into the food delivery market – with the introduction of UberEATS, where Uber drivers will be able to deliver food. And there are constant rumours about Uber getting into the courier game. Facebook is rather famously jumping into the world of virtual reality with its Oculus Rift acquisition pivoting to become more of a physical tech play, while it continues to court traditional media players in order to host content on the site with instant publishing. Netflix on the other hand is betting its future on original content. Remember, this was a company which, at the start, didn’t own any of its content. It simply bought up content from existing studios and media companies to put on its streaming platform. As Netflix has chewed away at market share, however, it has found traditional studios starting to charge through the nose and vigorously enforce geoblocks. So, Netflix is making its own shows – disrupting both the TV and movie industries to boot. These companies may not have started out with their own assets, but increasingly they are finding the future of their businesses lies in the owning of them. Maybe it’s a sign that the platform as a business model does have its limitations. Twitter at the moment is undergoing a well-publicised downturn because new customer acquisitions have essentially fallen flat. It’s trying to pivot with new product innovation, such as the recently launched ‘moments’ feature – but investors are finding that the business model may have just hit its peak and it now plateauing. Every man and his dog is now attempting to create the next tech unicorn marketplace – but do these businesses’ responses to the challenges they’ve faced to their model tell us anything about the limited nature of them?